Majority of the influential members of Parliament from Uganda’s districts are undecided yet on the bill to remove the age limit clause 102(b) from the constitution. At least 66.14% of the people that participated in a Nile Post opinion poll on the age limit amendment, oppose the removal of the presidential age limit cap. A total number of 4,944 respondents voted in the online poll over a 3 weeks’ span. The poll was published November 2, 2017 at 5:015pm. 36.8% of the respondents agreed that the constitution should be amended to remove the presidential age limit while 0.6% said they were still undecided. The age limit debate has divided the country with a sizeable number of people saying they oppose it and others saying they are in support. Whereas several opposition figures have already condemned the intention to scrap age limit as a move to gift President Museveni with a new term in office despite the fact that he will have clocked 75 years of age in 2021, NRM members have insisted the move is good for the country. Raphael Magyezi tabled the Bill in parliament in September in which he proposes that article 102b of the constitution be amended to lift the upper age limit. 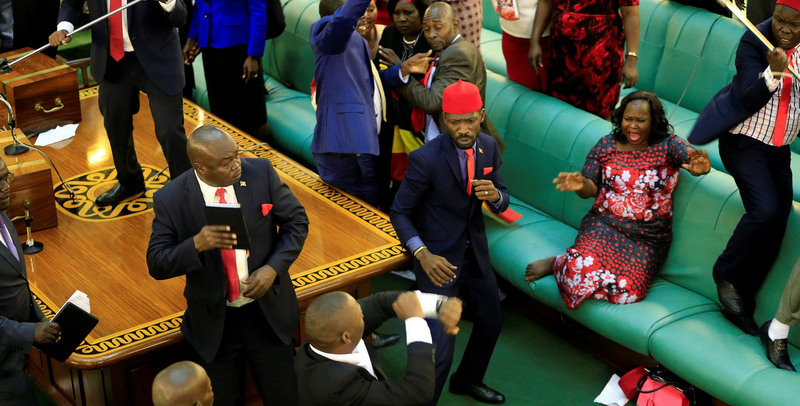 There was chaos following Magyezi’s Bill climaxed into a scuffle in parliament in which certain legislators were roughed up. The Bill was consequently referred to parliament legal affairs committee for scrutiny where it has been for the last month. It will be brought back to the House for further debate. Should the Bill be passed, it will mean that President Museveni will be eligible to stand for the presidency in 2021 even when he will be 76 years of age. Have you participated in the Poll? Vote now.